Rathindra N. Bose, vice president/vice chancellor for research and technology transfer at the University of Houston and the UH System, died after a short illness early Friday morning. He was 63. Bose, a chemist by training, was noted for his research in a number of areas, including medicine and energy. He discovered a new class of anticancer drugs, called phosphaplatins, and clinical trials involving the compound are underway at cancer centers around the country. Arriving at UH in August 2011, Bose guided the Division of Research through unprecedented growth, to $140.6 million in research expenditures for 2014. That is up from $92 million in 2011. He also oversaw research operations for the UH system. Bose was born in Bangladesh and earned bachelor’s and master’s degrees in chemistry from Rajshahi University. He completed a Ph.D. in chemistry at Georgetown University in Washington, D.C., in 1982. He came to UH from Ohio University, where he had served as vice president for research and creative activity and dean of the graduate college since 2008. He previously held similar positions at Northern Illinois University and Kent State University. His wife, Anima Bose, is an associate professor of engineering technology in the UH College of Technology. Bose also was Distinguished Professor of Biochemistry and held faculty appointments in the UH departments of Biology and Biochemistry, Chemistry and Pharmacological and Pharmaceutical Sciences. He published extensively and held six issued and four pending patents on cancer therapeutics and fuel cell catalysts. As his latest drug – part of a new family of compounds called phosphaplatins – began clinical trials, Bose said that developing a less toxic form of chemotherapy had become his passion. He was named a fellow in the National Academy of Inventors in 2013, in recognition of his work. Bose continued to maintain a lab at UH, but the bulk of his work focused on building the University’s research capabilities. Upon his election to the National Academy of Inventors, Bose shared his view of the value of research. 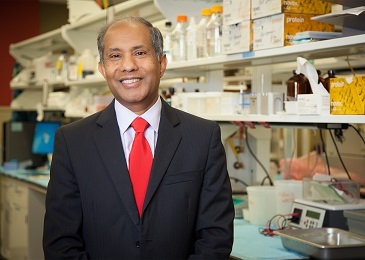 Bose was chairman of the Science Advisory Board of Phosplatin Therapeutics, and was a board member of BioHouston, Southern Universities Research Association, and the Gulf Coast Regional Center of Innovation and Commercialization. He had served as a reviewer for funding agencies, a reviewer for more than fifteen international journals, an ad hoc member of the Metallobiochemistry Study Section at the National Institutes of Health, a panel member for the National Science Foundation, and was a member of the editorial boards of three journals. Remembrances and expressions of sympathy may be sent to the Bose family in care of the Division of Research, 316 E. Cullen Building, Houston, Texas 77204-2015. A memorial fund to continue the mission of Dr. Bose’s research has been established in his name. Memorial donations may be made to The University of Houston, Gift Processing and Records, P.O. Box 867, Houston, Texas 77001-0867. Please note “in memory of Dr. Roth Bose” on memorial contributions. For more information, please contact the Division of Research at 713-743-9104 or research@uh.edu. The University of Houston will host a memorial service Aug. 11 at 1 p.m. in the Moores Opera House to honor Dr. Bose. Tuesday, Aug. 11, 1-3 p.m.
Moores Opera House, University of Houston, Entrance 16 from Cullen Blvd.